What a week! We have spent the days surrounded by the unique landscapes and wildlife that are a source of pride for all Africans, and must be safeguarded as this continent rapidly urbanizes. We have traveled from a remote lakeshore town (Buhingu) in Tanzania all the way to the Serengeti, engaging in countless discussions on global health and wellbeing along the way, sharing the 13-year history of Hope Through Healing Hands operating in Africa and learning a lot about health, healing, and sustainability from local and native peoples. 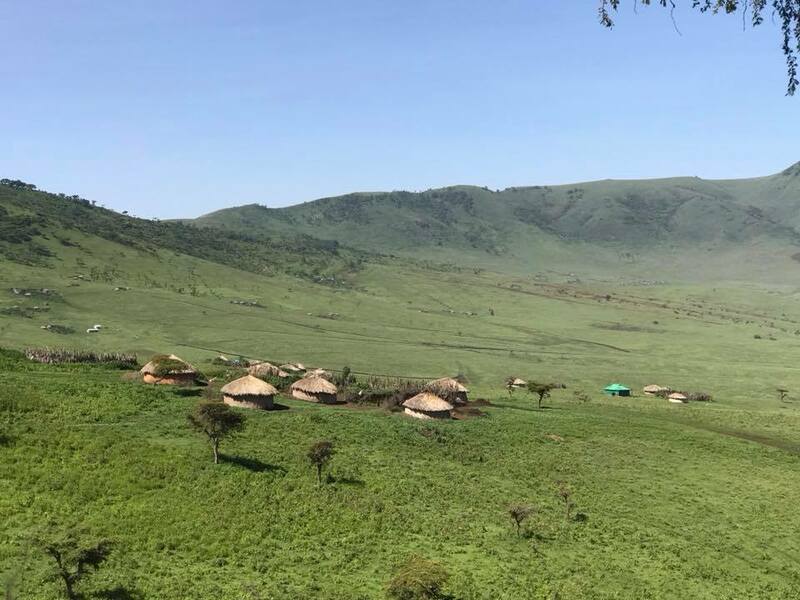 With The Nature Conservancy, my goal for Hope Through Healing Hands on this trip is to observe strategies to further population health through nature conservation. This week we’ve seen increasing access to clean drinking water; preserving and implementing sustainable policies for healthy land for grazing and growing food and fish stocks; and protecting wildlife that generates tourism revenue in financially vulnerable regions. When we left Lake Tanganyka, we traveled to the Serengeti and visited first the Maasai people, a semi-nomadic tribe in southern Kenya and northern Tanzania that lives in harmony with the land. Early this week we spent a remarkable and unforgettable day with the Hadza, an ancient tribe in Tanzania’s Great Rift Valley that is one of the few remaining full-time hunter-gatherer cultures on Earth. They are the ultimate integrator of health/well-being with their environment! Estimated by anthropologists to have ancestors tracing back 35,000 years to the region we walked on with tribal members, the Hadza are known as much for what they don’t have as for what they do: barely any possessions, no official leaders, no calendar besides the turn of the seasons. Their life is the land! But as Tanzania’s population has so rapidly grown, the Hadza have seen their hunting grounds encroached upon by settlers, farmers, and illegal poachers. For a tribe that lives almost entirely in the present, they have had to begin planning for the future so that their culture and way of life can be preserved. The health and preservation of the natural land directly impacts the health of the Hadza people. The TNC smartly recognized this, understanding that if a new wave of conservation efforts is to succeed, it has to improve people’s wellbeing, health, and livelihoods in a tangible way. A number of NGOs had been working with northern Tanzania residents on health, conservation, land rights, and social issues, but in 2009 the TNC aligned the separate efforts and brought together nine partners to form the Rangelands Initiative, which to date has worked with the Hadza, Datoga and Maasai tribes across 50 villages to gain legal rights to their land and thus far affects 7.4 million acres. They share the single goal of “protecting working lands for people and nature.” Now, not only are hundreds of thousands of acres protected from poachers and harmful development practices, the Hadza are thriving, as wildlife (a vital food source) returns to their lands, tourism and the sale of carbon offset credits provide revenue, and neighboring tribes no longer cause conflict over once-diminishing hunting territory. First, legal rights to the land, then introduction to governance. Just like the partnership at Tuungane, the Rangelands Initiative shows that collaboration and alignment of missions of multiple actors around a single goal is key to successful, lasting outcomes when it comes to health and wellbeing. Health is more than just health care. Health of people is enabled by the environment—food, water, climate, forests. Historically, Hope Through Healing Hands had focused on clean water, participating in digging wells around the world and personally surveying water projects in Mozambique. On this trip we are focusing upstream — the water source. Water-stressed cities are eager for solutions to protect source water quality and quantity. Protecting areas that supply water for downstream needs and restoring natural infrastructure (e.g., agricultural terracing) are cost-effective solutions that enhance the health and resilience of water supplies while improving livelihoods (e.g., via better agricultural yields) and population health outcomes, and building strong local support. Clear intersection of nature and health. We saw this powerfully in the Kibera Slum in Nairobi. 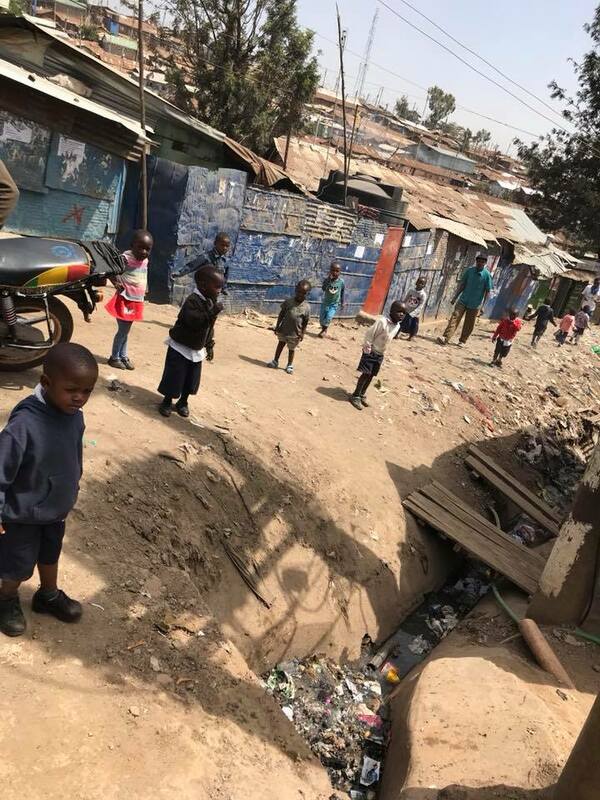 Kibera is a landmass the size of Central Park and contains 800,000 people. 6 to 7 people in each 10 x 10-foot structure. With only 6 water wells and open sewage, the water situation is responsible for disease and death. But we saw the work of SHOFCO including a fascinating innovative water project that transports water from tank to tank through pipes suspended like telephone wires, guaranteeing clean water and keeping the pipelines safe from vandalism. The project we saw is just a test, but I think it has huge promise! 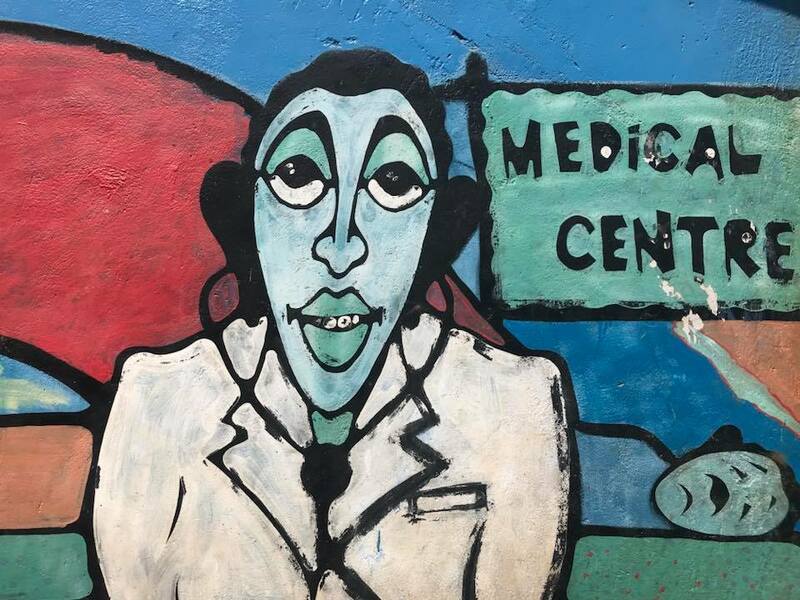 We toured a crowded clinic that sees 700,000 patients a year giving lifesaving therapy in difficult situations. Lots of ideas for Hope Through Healing Hands. 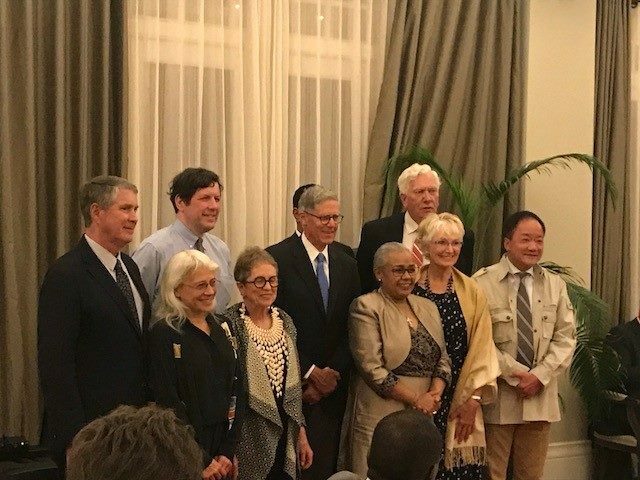 Finally, last night, Tracy and I met with First Lady of Kenya Margaret Gakuo Kenyatta in Nairobi where she discussed health, conservation, and anti-poaching successes over last two years. Like Hope Though Healing Hands, she placed huge focus on child’s health and maternal health. This entry was posted in Global Health, Hope Through Healing Hands, Malnutrition, Notes from the Road, photos, Travel. Bookmark the permalink.